"Advanced Advanced Dungeons & Dragons"
I have always had a pretty good relationship with my parents, with the exception of a few rough patches throughout my teenage years. I’ve always followed the rules, never really questioned their authority or rebelled, and never had a huge falling out. My brother and sister have had their fair share of fights and arguments and periods of silence with our parents, but for the most part we have all managed to coexist peacefully and respect and love each other. My mom’s side of the family was always dysfunctional and I think she knew that growing up and knew that she didn’t want to follow the same cycle that her mother and father and sisters did. My extended family fights with each other nearly all the time. My grandmother yells at my cousin; my aunt yells back at her. There’s this weird codependency that exists, though. Even though they fight and even though they argue… they still love each other and because of that, they still NEED each other. And, as weird and dysfunctional as it may sound, that bickering serves as a tie that binds them together rather than severs them. This is what “Advanced Advanced Dungeons & Dragons” focuses on for a good chunk of the episode: the relationship between Buzz Hickey and his son. The two don’t get along and have the kind of relationship that Jeff and William Winger had. It’s strained, to say the very least and it’s because both father and son (in each of these cases) are stubborn. It’s what happens when a powerful force collides with another powerful force spinning in the opposite direction. Those sorts of collisions are what create storms and cracks. But before we delve too deeply into the reason that the group is revisiting their Dungeons & Dragons-playing days, let’s discuss the plot of the episode, shall we? The episode opens with Hickey ranting about Hank Hickey, hi son with whom he spends little to no time with during the holidays. But it’s not the lack of quality time with his son that bothers him – it’s the fact that Hank is withholding Buzz’s grandson from him because of their feud. And that simply doesn’t fly. It seems like Buzz connects well with his other son, but not with Hank. They have nothing in common, he claims, because Hank just likes to play Dungeons & Dragons. And that’s when the group decides that it’s time for an intervention and they’re the perfect people to kick start it. Everyone – Jeff, Britta, Annie, Abed, Shirley, Chang, Dean Pelton, Hank, and Buzz – cram into Abed and Annie’s apartment and Abed meticulously hands each person their character sheet, with Buzz and Hank conveniently playing a father and son duo. Hank wasn’t born yesterday and knows what is happening. I really enjoyed the fact that “Advanced Advanced Dungeons & Dragons” subtly made some meta commentary about the denseness with which the show (and other shows) try to hammer certain messages into an episode by beating the audience over the head with it multiple times. It feels, as Hank expresses, extremely contrived and it’s extremely evident. Clearly, the group is trying to force the game to mirror the real-life relationship and though it worked for them in the past, it’s not going to in this episode. Hank switches up and redistributes the sheets, with everyone in a new persona. And Annie gets to be Hector the Well-Endowed once more! With everyone in their newly assigned roles, the game begins… until Hank decides that he doesn’t want to play by the rules. It’s more than that, though: he just doesn’t want to be forced into an emotional bonding experience with a father that he doesn’t connect with. Almost immediately, Buzz and Hank are at odds and it’s a testament to how strong-willed they both are as individuals that neither backs down and neither leaves the game. Instead of retreating, the Hickeys do what they do best. They fight. So when Annie casually tries to encourage Hank to head toward the Black Tower so that the group can fight the Necromancer and Hank can bond with his father, Hank attacks her in self-defense. What the group doesn’t realize when they stage the intervention is this: they staged an intervention for Neil when he was at rock bottom and when he felt most vulnerable and worthless. They played Dungeons & Dragons to cheer him up and accomplish a goal. Hank Hickey is not at rock bottom. He’s on the defense and the study group has backed him into a wall, which is a very dangerous place for them to now exist. It becomes even more dangerous for the study group when the fire spell that Hank casts on Annie causes the bridge they’re standing on to be set on fire as well and the group plummets into the river below them. And just like that, no one in the group is having much fun anymore. Buzz is furious with Hank and the two hash it out in the middle of La Casa de AbAnnie. I think one of the greatest things about Buzz Hickey that separates him from the rest of the group is that he’s more quick to admit when he’s upset than any of the others. Where Annie and Shirley and Jeff and Britta would feign smiles and good intentions, Buzz freely admits his anger to Hank over hoarding his own grandson from him. What Hank says next stings more than any fake weapon in the fake game though: he tells Buzz that the boy is HIS son, not Buzz’s grandson. Ouch. Not only does Hank have a chip on his shoulder for the way his father treated him growing up, but he out and out refuses to acknowledge Buzz’s role in his own son’s life. The one person to intervene during the argument is the one person who knows about father-son issues most of all: Jeff. It’s a testament to how much he’s grown over the years that he freely opens up to Buzz, Hank, and the rest of the group about his own struggles with his father. Jeff admits that the reason their relationship was never repaired was because they refused to remain in the same room together and work their issues out. They kept running away and if they hadn’t… maybe they would be different. Buzz and Hank care naught about Jeff’s words of wisdom and Hank decides to leave. But Buzz is nothing if not stubborn and decides to get his son to stay and play Dungeons & Dragons by raising the stakes: if he wins, he gets to attend his grandson’s birthday party; if Hank wins, Buzz cannot attend Christmas or Thanksgiving with the family, freeing up Hank to join the holiday gatherings. Abed informs the group that the bridge collapse split them into two factions on the river: Jeff, Annie, Hickey, and Shirley are now on one side while Hank, Britta, Chang, and Dean Pelton are on the other. Things aren’t going too well for the first group with Hickey taking (selfish) charge and trying to beat his son to the Black Tower. Because of his selfishness, he loses a member of his team – Shirley – in battle. When Hickey confronts Abed about the improbability that he would have missed while attacking the Hob Goblins… Abed humbles Hickey by reminding him that the game and real life are different. It’s a nice reminder, especially coming from Abed, that Hickey cannot let his temper, rage, or personal issues cloud his judgment, nor can he let his own personal disdain prevent him from learning how to correctly play the game. Hickey doesn’t take the game seriously and Abed presents him with a warning: Hank DOES take the game seriously and understands the stakes involved; Hickey seems to be disregarding them and that will cost him more than an imaginary character if he doesn’t wise up. The other group is faring relatively well, with Hank casting a healing spell on Britta and the young woman hesitant to accept because she disagrees with how Hank and his father are handling (or not handling) their personal grievances. Hank defends his behavior by explaining that he isn’t the bad guy, really – Buzz was never around for him as a child, and that impacted and affected him as an adult. The group doesn’t have much time to dwell on sentiment though, as they have a game to continue and another group to beat to the Black Tower. While Hank and the rest of the group are treading the route of peace with some sky spiders (ewwwww, I’m with Ron Weasley when it comes to spiders), the Hickey clan is doing what Buzz does best: tactically invading and taking out the Hob Goblins. Just as Hickey is about to kill all of the Hob Goblins, he realizes something: he can take two of them as prisoners and get them to talk, revealing valuable information. He utilizes his knowledge as a former soldier in order to advance both him and his team in the game. Plus, Hickey DOES begin to take the game seriously as revealed by both his strategizing and tribute to Shirley’s character. The interrogation and manipulation works – Abed-as-the-Goblins reveal that they know the location of the Black Tower. Meanwhile, the hippie-dippie-trippie group is singing as the flying spiders (ewww) land and explain that they know how to get to the Black Tower. The group is excited, but Dean Pelton is distraught, having received the character Hank was supposed to be (with Jeff as his “father”). Unable to bear the separation of just one room apart, Dean Pelton writes to Jeff and Abed delivers the message. As it turns out, if Jeff’s character rubs his sword’s hilt (go ahead and laugh it up) while Dean Pelton’s rubs the blade, a beam of light will emit from both, leading them toward each other. The groups then learn the truth: they are each equi-distance from the Black Tower and will arrive at the same time. And the meeting will not be one of peace, but of war. DUN DUN DUN. While Hickey caters to Jeff and Annie’s tendency to not trust others (even though they hold a sidebar together and encourage Hickey to forfeit) and explains to them that their own friends have now turned their backs on Jeff and Annie and are “drinking [Hank’s] Kool-Aid,” in Abed’s room, the other group IS drinking the Kool-Aid. Hank feigns innocence and uses that as his tactical edge with his team. He brands Buzz as a self-centered monster while Buzz brands Hank similarly. So the two factions meet and what happens next is an all-out war, started by Dean Pelton, of all people. In an effort to balance numbers and repair the father-son relationship, which was especially nice meta commentary, Dean Pelton tries to cross sides onto Buzz’s team but is attacked in the process. This leads to a massacre that leaves only Buzz and Hank standing. You see, the problem lies in the fact that both Hickeys refuse to trust each other. They reject the idea of putting aside their egos and their pride and – most importantly – their past record of wrongs in order to mend fences and move forward. How can you repair a relationship if you refuse to forgive grievances and reject the idea of doing anything peacefully? The answer, of course, is that you cannot. But the game of Dungeons & Dragons was never going to accomplish a happy Hickey family reunion. Why? Because, unlike Neil who wanted to fit in and belong… Buzz and Hank didn’t WANT to reconcile. They oddly like their bitterness and their anger and their frustrations with each other. And though it’s an intensely dysfunctional relationship, what Jeff comes to realize and reveals to the group at the end of the episode is this: it’s still a relationship and they’re still together. Even when they’re yelling and fighting, Buzz and Hank are together. And isn’t that what matters? Back to our battle: suddenly everyone is flinging arrows and drawing swords and yelling at each other because that’s what dysfunction does to people. The battle ends up leaving everyone but Buzz and Hank dead. And it leaves Abed feeling more than a little bit defeated. Both Buzz and Hank end up making it to the Necromancer’s bedroom and… that’s where the tale ends because, as Abed explains, the creature has fled while the father and son spent the past hour arguing. Abed’s frustrations mount when Buzz snaps: “You owe us an ending.” That is when Abed reveals the point of the Dungeons & Dragons game: his role is to merely exist and construct a world in which everyone has ample opportunity to succeed or fail based on the choices they make and the roll of the die. It’s not Abed’s job to facilitate growth and it’s certainly not his job to give characters – or real-life relationships – justifiable endings. His job is to facilitate a world in which those revelations could and should be reached on their own. But unlike the study group’s first encounter with the game and the Pierce/Neil resolution, Buzz and Hank don’t learn to become better people or even better at relationships. They don’t mend fences but that’s not Abed’s fault – it was never his job. What Buzz and Hank DO learn is how to compromise slightly even in their frustration and disagreements, which is more than they had been able to do throughout the entire game and possibly even their relationship. And that’s when Jeff comes to his realization after Annie asks what has happened to the father and son: he explains that Buzz and Hank haven’t become closer; they don’t even really like each other. But for as often as they fight, they also can’t stand being apart. And that, Jeff explains as the group sneaks out of the apartment, is what most fathers and sons can hope for – a relationship in which they may not always agree and may fight often, but one in which they won’t walk away and will NEED to stay together in order to be whole. I’ll admit: the ending/resolution of “Advanced Advanced Dungeons & Dragons” felt a bit understated for me. While I do appreciate that the show didn’t wrap up the episode exactly like it did with the first installment, I felt slightly befuddled by how quickly everything ended. The “revelation” and Winger speech by Jeff seemed to be like that of a fog on a sunny morning – prevalent enough to see and understand, but still not completely there. Nevertheless, the game draws to a close, but only because the study group members escape. Abed isn’t so lucky and is forced to remain with Buzz and Hank until they decide to end their quest, whenever that happened to be. And the chances of Buzz and Hank rekindling some sort of father/son relationship is rare. The chances of them ever managing to see eye-to-eye on anything, ever, is rare. The chance that Buzz will ever understand his son or that Hank will ever forgive his father is rare. But I don’t think “Advanced Advanced Dungeons & Dragons” ever wanted to solve those problems. Some things, some relationships, are just too complex to resolve over the course of one game. It could take years of therapy, dozens of dinners and coffee dates, and hours’ worth of phone calls and holiday gatherings to repair wounds that run as deeply as those that are within families tend to do. Somehow though, I think the decision to stay together in spite of it all – to never hang up the phone or leave in the middle of a conversation or go to bed angry – is what really repairs relationships in the end. So maybe Buzz and Hank will be okay. Great job on the episode, Matt Roller! And serious props to the amazing directing by Joe Russo. Additional notes: bless the team that puts the sound effects into the D&D episodes. You guys deserve all the awards. 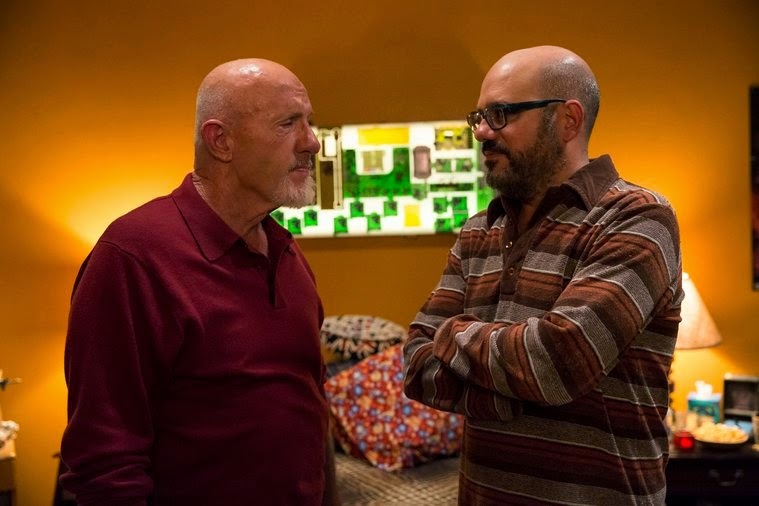 David Cross was fabulous in this episode as Hank Hickey. Though it was difficult for me to see him and not think of Tobias. Jim Rash and Danny Pudi were shining stars in the episode. I love the callbacks: Hawthorne Mountains and Brutalitops Memorial Bridge. Annie’s stuffed animals are so adorable.